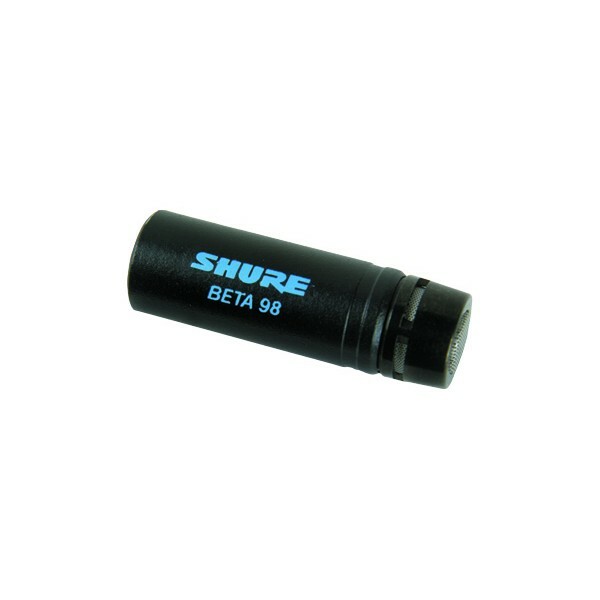 The Shure Beta 98/S is a compact, high-output supercardioid condenser microphone for professional sound reinforcement and studio recording. Its extremely uniform supercardioid pickup pattern provides high gain-before-feedback and excellent rejection of unwanted noise. Its high maximum sound pressure level (SPL) makes it useful for a variety of instruments including drums, piano, reed, wind, and string. The Beta 98/S can also be used for amplified guitars. The optional A98D drum mount has a specially designed gooseneck that allows the microphone to be positioned freely, yet holds it securely in place once the ideal placement has been found. Polar Pattern Supercardioid (as supplied), uniform with frequency, symmetrical about axis. Cartridge for cardioid polar pattern also available. Phantom Power 48 Vdc +/- 4 Vdc(IEC-268-15/DIN 45 596), positive pins 2 and 3. Cable BETA 98/S: 7.6 m (25 ft) light-weight, two-conductor shielded, TA4F to TA3F mini connectors. BETA 98D/S: 4.6 m (15 ft) heavy-duty, two-conductor shielded, TA4F to TA3F mini connectors.